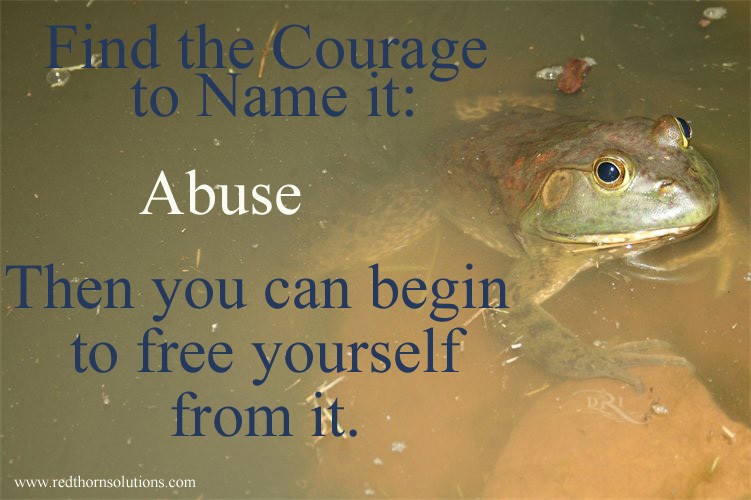 People often don’t know they are in an abusive situation. One might wonder why they don’t know. Well, when for a full lifetime people have been led to believe they are responsible for the reactions and responses of others, they own it. They feel they need to do better or be better so that that their circumstances can change. Also the abuse, the mind control, are often so subtle that they are not, over time, easily recognizable. It is like the boiling frog, it happens gradually and they are now unaware of the truth of their circumstances, until they are entrenched in it and all they know is they hurt, but many times they are still unaware of what the truth of their hurt and circumstances are. Often when I say in response to someone who shared with me an experience they had with someone they believe wants to love them, “that is abusive”…people immediately jump to denial. They then begin excusing away the behavior of those that they think they “love.” They speak of the poor difficult childhood of the party who is diminishing and destroying their spirit, and I remind them, we are not children anymore. I then ask “Would you do the things that are right now being done to you?” At which time, and without fail, I receive and emphatic “NO!” “Why is that?” I respond. Which always leads to a slight gasp as they realize that the appropriate label of the behavior that moments ago they felt was okay to endure, is in fact cruelty, mean, something they wish never to be, but are evidently willing to accept. So why would we allow such treatment of ourselves? Does that not suggest we believe we are less worthy? Loving yourself fully will indeed heal every wound. Love yourself where you are and how you are. Without exception. We are responsible for our behavior, and although compassion can be offered for the poor, diminishing and loveless childhood, at some point, excuses are not acceptable. Ultimately we are each responsible for who we become, and if we are truly interested in recovery, we would be putting forth effort. So if the person whose behavior you are excusing away has less devotion than you do to their healing, you will not arrive where you hope to. And don’t be fooled by the two week improvement to keep you on the hook and in their “game.” You deserve the real deal, don’t settle for anything less. Anything in opposition to Love is something less that you deserve. My experience is that most times, the abuser is not looking to heal, only saying they want to and will as they fear you will leave, but not seeking anything to actually allow that to happen. Each and every one of us are both author and authority in our life. We create the quality of our life, and sometimes that means we have to release people from our grip rather than try to mold them into who we wish them to be, and accept that they will never be the person they promised or that we wish they were. This is okay. They have the right to be precisely who they are. Be thankful for the gift of now knowing what you don’t want, so you can find what you do want. And the sooner we realize that and move forward seeking and manifesting what which we now know we truly deserve, the quicker happiness and freedom will be experienced as real; because it is. « The Power to Restore Your Heart Is Within You! I am having such a hard time reaching out about this even though I am confident in what it is. I am suffering CPTSD like crazy and all I want and actually feel I need is to find someone who understands to talk it out with and I could start to gain my momentum back. I would have to be responsible in keeping it going, but I am having such a hard time reaching out because part of my childhood conditioning was DO NOT TALK about the reality. I have joined some groups, but my therapist is only perpetuating the abuse and I experience agoraphobia, depression and bouts of illness which developed from the extreme stress and lack of self care I went under to cope or put my energy into this person. I feel ready to face all this for what it is but I am trapped under this cycle within myself and I actually need a live human to talk this out with. It’s driving me mad again to be isolated from support. Hi, am just wondering why do they want to hurt us so much mine still kept me hanging on for 8 months after our split leading me to believe he wanted me back that he just needed to sort his life out as he had issues . All I done was love him be there for him and care for him , it hurts so much and al he done as I know now was lie, cheat and deceive me all through our relationship and also the 8 months after . I thought he was the man of dreams and now he is the man in my living nightmare ! Why did he want to destroy me ? Are sociopaths really ill or just nasty people this confuses me also ? The why is a tough question. I am not a doctor, but I do have my beliefs. I don’t believe their mind works like ours. I believe that in their mind they are simply playing a sort of chess game, and their only goal is to win. They think everyone’s mind is like that and is calculating and trying to “win.” And having no conscience, they don’t feel true remorse like we do, so to them they just want what they want and that is control. So, he kept you in the loop because anytime it ends they want it on their terms…and I believe they enjoy the way we fall for it. A victory to them is your failure. I feel that makes them pretty nasty, whether they are conscious of that or not, who knows…and it is best not to care enough to find out. Just work on you…take care of you. If you haven’t read my book Me and My Shadow you might want to, I go into a great deal of detail and also about half way through I move to the healing process. I hope you steer clear moving forward. Here is the link for my book : http://tinyurl.com/Book-and-Kindle Good luck to you and I am sorry you suffered, but I am glad you got out early! I received your book today and will start reading later. Excellent! I hope it offers you tremendous value…if it does and you think of it, please offer a review on Amazon. (You don’t have to use your name if you would rather not). I wish you well on this journey! Will do, thank you !